Humans cannot analyze information in an unbiased way like computers can. According to Greenberg, people “are far from perfect when it comes to gathering information about others and then making judgments about them” (Greenberg, 2010). As a matter of fact, it is more probable “to be the rule than the exception” that people’s judgments of others will be flawed (Greenberg, 2010). When all is said and done, people are not precisely unbiased in the judgments they make. As a result, this can lead to significant issues for people and the organizations where they work. There are numerous systematic biases that get in the way of making entirely unbiased judgments of others. “These reflect systematic biases in the ways [people] think about others in general” (Greenberg, 2010). These biases together are known as perceptual biases. Perceptual biases are defined as “predispositions that people have to misperceive other sin various ways” (Greenberg, 2010). Types of perceptual biases include the fundamental attribution error, the halo effect, the first-impression error, selective perceptions, and the similar-to-me-effect. The similar-to-me affect “states that individuals get along with people who tend to look and think like we do” (The Pennsylvania State University, 2015). It is a fact that “people with similar personalities tend to get along because they think, feel and act very similarly” (The Pennsylvania State University, 2015). The similar-to-me effect represents a possible cause of bias when it comes to judging other people. “In fact, research has shown that when superiors rate their subordinates, the more similar the parties are, the higher rating the superior tends to give” (Greenberg, 2010). “This tendency applies with respect to several different dimensions of similarity, such as similarity of values and habits, similarity of beliefs about the way things should be at work, and similarity with respect to demographic variables (such as age, race, gender, and work experience)” (Greenberg, 2010). 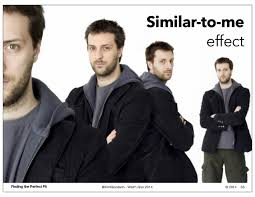 The similar-to-me effect seems to be partially the outcome of the tendency for “people to be able to emphasize and relate better to similar others and to be more lenient toward them” (Greenberg, 2010). Yet, “it also appears that subordinates tend to be more trusting and confident in supervisors when they perceive as similar to themselves than those perceived as dissimilar” (Greenberg, 2010). Subsequently, they may have more of a “positive relationship with such individuals and this may lead superiors to judge similar subordinates more favorably” (Greenberg, 2010). Interviews are a type of employment tool used by employers to gain an understanding of a candidates experience, personality, etc. for selection for various positions. They are an essential part of the employment process because they are a chance for the employer to learn about the candidate and see if they are a fit for the position. One of the drawbacks to interviews is the similar-to-me effect however. According to Sears and Rowe, “higher interview ratings are given towards interviewees who possess similar attitudes and demographics as the interviewer” (Sears & Rowe, 2003). One justification for this effect is through pure similarity. “If both the interviewer and interviewee are similar, whether in demographics or even education level, they will develop more accurate perceptions of the other’s self-concepts, as the two self-concepts will be similar” (Sears & Rowe, 2003). Biases make sense from an evolutionary perspective because “biases arise because of [people’s] use of heuristics, or rules of thumb, to govern much of [their] daily decision-making” (Fiske, 1999). However, heuristics can lead to biased decision making such as in the workplace, particularly in a job interview. Job interviews are a “highly subjective process” and “interviewers often have a range of biases that dramatically affect their perspectives of individual job candidates” such as the similar-to-me-effect (Fiske, 1999). Although this particular biases can be difficult to overcome, Fiske advises people to be themselves but to look for any areas of potential overlap between them and their interviewers” (Fiske, 1999). Greenberg, J. (2010). Perception and Learning: Understanding and Adapting to the Work Environment. In Behavior in organizations: Student value edition. Place of publication not identified: Prentice Hall. The Pennsylvania State University (2015). PSYCH 424: Applied Social Psychology. Lesson 12: Relationships/Everyday Life. This entry was posted on Friday, April 17th, 2015 at 8:59 pm	and is filed under Uncategorized. You can follow any comments to this entry through the RSS 2.0 feed. You can leave a comment, or trackback from your own site.